*You can use any vegetables you have on hand or any vegetables that you love. This is the list I used today including my latest love, Klondike’s Potato Medley. They come with an assortment of colored potatoes. My favorite are the purple potatoes! They taste just like regular ones but with this fun, vibrant color. If you haven’t tried them, you should! Kids go crazy over them! Kale would be super yummy in this dish too as it gets very crispy when roasted. I’m all about layers of texture and flavors in my rainbow colored bowls of health. Everyone should aim to eat at least one thing, from every color scheme, everyday. The trick to perfect roasted vegetables is a preheated hot oven. So preheat your oven to 425 and wait for it to get piping hot before you put your veggies in there! Spread the first 5 ingredients in a single layer on a cookie sheet sprayed with non-stick cooking spray. Spray the tops again with the spray and sprinkle on the no-salt seasoning to your taste. Put in the oven for 20-25 minutes until roasted and slightly charred. Meanwhile, place remaining food ingredients in a large bowl and toss to combine. 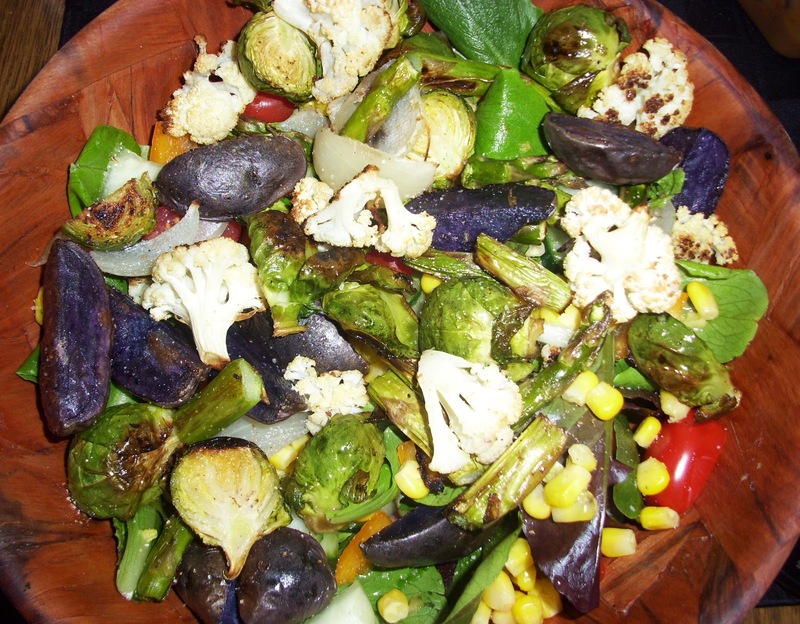 Once oven roasted veggies are done, remove from oven and allow to cool enough to handle. Lay on top of your salad and drizzle with balsamic vinegar. Dive in and enjoy! If you have leftover roasted veggies from dinner one night you could use those and this recipe would be even faster!